Professor, Department of Home Science, Mata Jija Bai Govt. 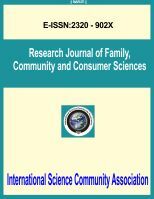 International Science Community Association are publishing an international peer reviewed journal Research Journal of Family, Community and Consumer Sciences. 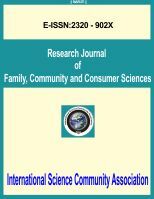 It is the vision of International Science Community Association to publish research papers, research articles, review papers, mini review, case study and short commutations in all areas of human study without financial restriction. Coverage Area: Researches in the field of Home Sciences including action research, marketing research, observations, surveys, interviews, knowledge and skill assessments, affective tests, integrity and ethical behaviour, child education programmed, child development programme, family studies and management, human resource management, housekeeping management, home management, human resource development, education and training programmed, social development, consumer behaviour, family health and nutrition, food packaging and storage, food and nutrition, textiles, apparel and merchandising, etc.